Raspberry Pi is a small low cost platform for my new project - PiAstroHub. Is it fast enough to handle the guiding software? I know the CPU in it is particularly weak (attempts to run linux with a GUI without GPU acceleration have been very painful! ), but it's enough to handle a lot of stuff. And the GPU looks reasonably good, and could definitely take a lot of the load in a guiding app. I am using a low-quality Class4 SD card to run Raspbian and it takes about 8 sec for a 2sec shot to complete a cycle. I will use a good Class 10 card and expect 2x-2.5x improvement. If I want more improvement, I may switch off image display during guiding in the source code because a graph can show guiding errors. Now, I use a Sandisk 16GB Class 10 Extreme (45MB/s) SD card. I tested cycling shots with an exposure time of 1 sec. The time interval between shots (exposure+download+image display time) is about 3 sec. And for an exposure time of 2 sec, the time interval is about 4 sec. ADDED NOTE (Aug 19): I could not reproduce the speed achieved above. I need to check! Anat, ignore my email about the SD card, just noticed that you've posted the answer here. 1. Set Locale to "en_US UTF8" otherwise there will be an error message when open PHDguiding. # To check if the QHY5 is recognized, type the following command and then plug and unplug QHY5. QHY5 should be listed. # Open an X terminal and type "PHD" in a command line. PHD will open in an X windows. Very cool project. Keep this going ! I found that INDI drivers and OpenPHD were quite slow and inconsistent. 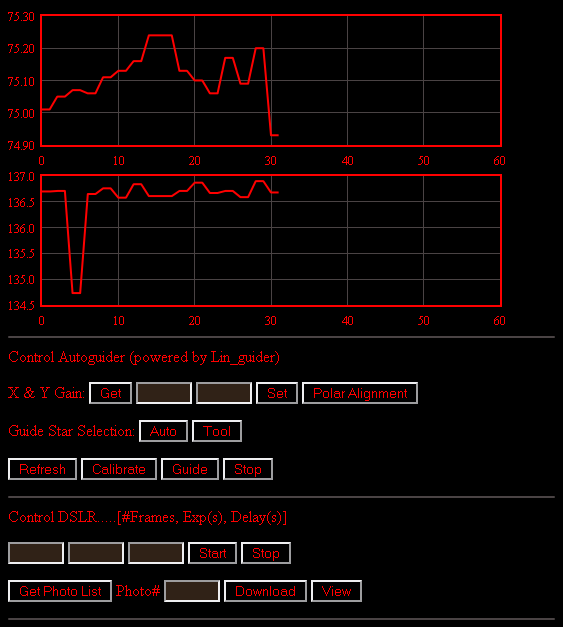 So, I compiled Lin_guider on Raspberry Pi. 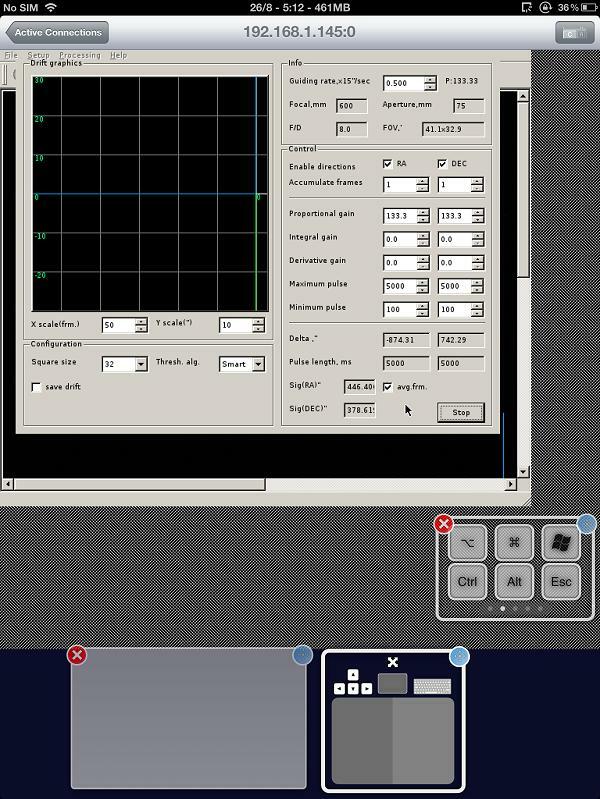 I also attach a photo showing how the program looks like on X-server (iSSH) on iPad. It is that simple Now all tcp communications via Port 5555 will be redirected to a serial port. I recommend using a PL2303-based usb-serial adapter. Then set Port as 5555 in SkySafari. Done! PiAstroHub will function like SkyFi. 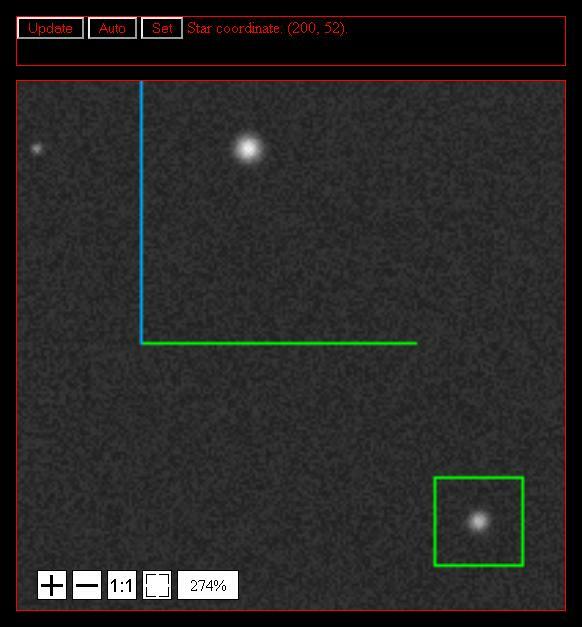 I just added the plate-solving feature using the engine from astrometry.net which was capable to perform blind solving. After getting an image, I use plate-solving to find the exact pointing position and send the RA-DEC values to align a mount. The crosshair in Skysafari is automatically synced to the new position So, Goto can be done from SkySafari with high pointing accuracy. Just a reminder that if you want to use the astrometry tool, you do need to download the INDICES. Do contact the guys from astrometry for them. Yes. 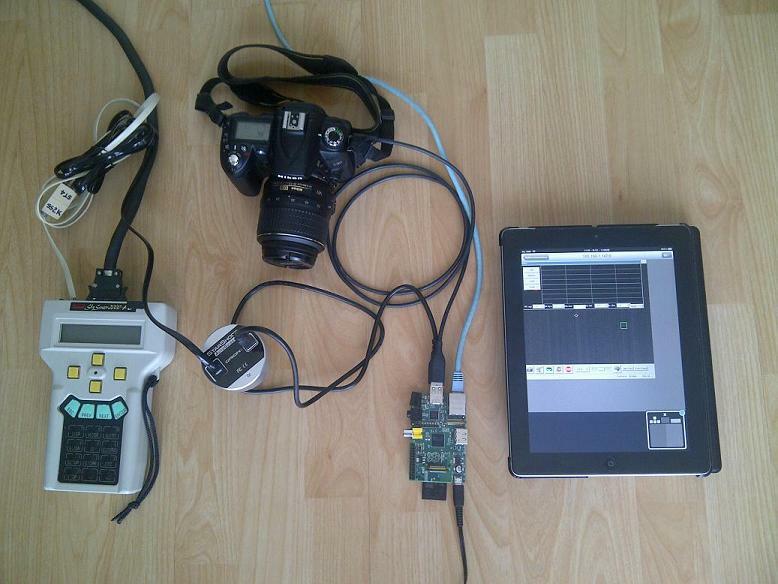 We use the same gphoto2 library to control a DSLR. I am making a web application to wrap up all features and will post an update soon. This is awesome, thanks so much for doing the legwork. I've finally got my Pi up and running in wifi master (AP) mode and have ser2net configured. I can't believe it was that easy -- to think I nearly bought a SkyFi for more than twice the price of the Pi! This will be great for me as I'm usually stuck up on my apartment roof with a netbook. I'm slap bang in the middle of Shanghai and due to poor visibility and blocked view in various directions, I can't always align properly, and used to rely on "syncing" a lot using KStars / INDI, which was painfully slow and cumbersome on a netbook. I've also been using gphoto2 for a while to control my DSLR, so I'll be doing that too. I'm interested in the astrometry.net solver too, I wonder how that will work in my orange skies. For autoguiding, I've added a piggyback mount to my ETX-125 and have a modified webcam, but have never been able to get a decent polar alignment, and the ETX mount isn't great anyway. With all the functionality sitting on the Pi however, it's one less item of faffing around to get set up, so I'm much more likely to try it now and succeed I think. I wonder how a focuser would integrate into this setup -- I remember LibINDI allowed for controlling focusers. An ideal setup would be taking a few photos with gphoto2, and doing rinse-repeat trial & error autofocusing. I plan to integrate my Pi in a project box with 12V / 5V PSU so I basically have everything contained in one box with one power plug. The dream setup would be an automated setup as the Autostar is so slow and archaic -- auto align, auto focus, Goto provided by Skysafari. INDI supports some focusers: Robofocus, Meade, and JMI. "Semi-auto" focusing is possible. The focuser movement and camera exposure are done in a series. Then the star images are compared by a user. The focuser is commanded to move to the position of the sharpest star image. I'm impressed, that is pretty cool! Jus the fact it replaces the skyfi is pretty cool by itself. Is that a starshoot autoguider you have hooked up? Yes. I use the Orion Starshoot Autoguider (aka QHY5) for the development. Interesting, I had looked at thee when they came out, but of course they were sold out, now that availability is improving I might have to pick one up. Are you using a wireless wi-fi adapter to do ad-hoc networking so you can simulate a sky-fi, or is your system hooked up to a hub/router? I tried a wifi dongle (Asus N10) and found that it was pretty slow for an adhoc network. I use an Edimax Nano router instead. This is the interface of PiAstroHub. A user can control Linguider and DSLR from a webbrower in a mobile device. There is a feature to find a guide star automatically in the new version of Linguider. The feature is incorporated in PiAstroHub. A user can also manually select a guide star by clicking "Tool" in "Guide Star Selection". That will open another window to manually select a guide star.